Opto Engineering LWIR is a family of longwave infrared Optical lenses specifically designed to operate in the 8-14 µm wavelenght region with uncooled detectors (a-si, vOx). The infrared Optical lenses can be equipped with any custom mount interface at no additional cost. In the design of the infrared Optical lenses, great importance was attached to a good image quality and a large aperture (small F-number). These infrared Optical lenses, mounted on an uncooled LWIR camera are the perfect choice for a variety of applications spanning from industrial to military, including temperature measurement for process quality control and monitoring, predictive maintenance, imaging through smoke and fog, medical imaging. A positron emission tomography system for small animals has been designed for research purposes, and developed at Instituto de Fisica, UNAM, Mexico. Its detection modules are based on pixelated scintillator LYSO crystal arrays coupled to Hamamatsu H8500 position-sensitive photomultiplier tubes. The front-end electronics are based on nuclear instrumentation modules (NIM) and in-house built readout circuits. Peak signal digitization is performed with a commercial analogue-to-digital acquisition (DAQ) board. The system has been characterized for spatial, timing and energy resolution, system dead time, absolute sensitivity, scatter fraction and noise equivalent count rate (NEC). The results indicate that the detection modules are able to identify individual crystals (out of 400) with up to 8-to-1 peak-to-valley ratios with individual crystal energy resolution ranging from 7 to 15% at 511 keV. The timing resolution is 1.9 ns and the system dead time was found to be 16.8 s and 42.1 s for 0.5 ml and 10 ml volume sources, respectively. The measured absolute system sensitivity is 0.11% and the scatter fraction from a glass capillary inside a 2.5 cm diameter mouse phantom is 21.5%. A true NEC maximum value was not achieved with the system due to saturation of the PS-PMT output signals for activities above 0.27 mCi. Results from a Na18 F PET bone scan of a 30 g mouse are shown. Sapphire Windows are manufactured from single crystal sapphire, making them ideal for demanding applications (such as laser systems) because of their extreme surface hardness, high thermal conductivity, high dielectric constant and resistance to common chemical acids and alkalis. Sapphire is the second hardest crystal next to diamonds and, because of their structural strength, sapphire windows can be made much thinner than other common dielectric windows with improved transmittance. Chemically, sapphire is single crystal aluminum oxide (Al2O3) and is useful in a transmission range from 0.2 – 5.5μm. It has been established opinion since the 1950s that organic crystals and liquid scintillators can work for detecting neutrons, but that plastics are not suitable for neutron detection. For years, plastic materials have been used in large, low-cost detectors for portals and high-energy physics facilities, and while they could detect neutrons and gamma rays, they have been incapable of distinguishing one from the other, which is key to identifying nuclear substances such as uranium and plutonium from benign radioactive sources. Organic crystals serve as one of the best neutron detectors, but the crystals can be difficult to grow and obtain in large volumes. Liquid scintillators present some hazards that hinder their use. Gas detectors that rely on helium-3, a byproduct of tritium’s radioactive decay, have run into problems because the United States now produces markedly less tritium. However, plastics have more flexibility in their composition and structure than crystals, as well as having none of the hazards associated with liquid scintillators. Scientists at Lawrence Livermore National Laboratory have developed a plastic that can detect neutrons, something previously thought impossible. Livermore scientists demonstrated a plastic scintillator that can discriminate between neutrons and gamma rays with a polyvinyltoluene (PVT) polymer matrix loaded with a scintillating dye, 2,5-diphenyloxazole (PPO). They have found that plastic scintillators have a roughly 20 percent finer resolution for neutron-gamma ray discrimination than liquid scintillators. New plastic that detects neutrons could be far cheaper and more flexible than traditional detectors. Given the material’s low cost, huge plastic sheets could be formed easily into dramatically larger surface areas than other neutron detectors currently used and could aid in the protection of ports, stadiums and other large facilities. Plastic scintillators could assist in detecting nuclear substances such as plutonium and uranium that might be used in improvised nuclear devices. As well as help in detecting neutrons in major scientific projects. The applications for wave plates are many and varied. 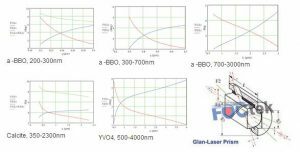 They can find use in areas such as power attenuation of a laser and optical isolation. In biomedical applications, wave plates are used to determine the polarization of body fluids in microscopes and to correct for unwanted phase shifts. They are also used in astronomy, in the semiconductor industry and in aerospace. In short, almost every application that requires polarized light uses a wave plate to control polarization. The materials used for them are determined by the application. These options include a wide array of birefringent crystalline materials, total internal reflection retarders, polymer retarders and liquid crystals. A wave plate produces a phase shift between the two orthogonal polarizations of a light wave. This is done via birefringence, or when the index of refraction along the slow axis differs from that along the fast axis. Common wave-plate retardances include quarter- and half-wave plates. The quarter-wave plate turns linearly polarized light into circularly polarized light with the input light at a 45° angle between the fast and slow axes. 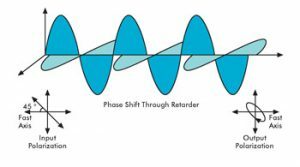 The half-wave plate is a polarization rotator as it flips the polarization direction around the fast axis of the retarder. These are manufactured from various materials, depending on the application, with costs ranging from tens to thousands of dollars. Electron pulse induced absorption and their decay kinetics have been investigated in samples of GGG crystals with different starting absorption spectra. It is shown that for all samples there appears a wide transient absorption (TA) band with two maxima in the region 14,000-17,000 v cm m 1 and 22,000-26,000 v cm m 1 . TA decay kinetics measurements in 14,000 v cm m 1 and 22,000 v cm m 1 are two-exponential (with half-time order several tens and several hundreds ns). Analyzing the obtained results, we can suppose that low and high energy TA bands are connected with the F + (or O m ) and F transient color centers (TCC) respectively. Glan Laser polarizer is made of two same birefringent material prisms that are assembled with an air space. The laser polarizer is a modification of the Glan Taylor type and is designed to have less reflection loss at the prism junction. The laser polarizer with two escape windows allow the rejected beam to escape out of the laser polarizer, which makes it more desirable for high energy lasers. The surface quality of these faces is relatively poor as compared to that of entrance and exit faces. No scratch dig surface quality specifications are assigned to these faces. The laser polarized field F1 and F2 of these is shown in the plot below. Sb3+-activated cdwo4 crystals phosphors were designed according to sp energy levels regularities of Sb3+ ion in some inorganic compounds. The sp energy levels regularities of Sb3+ in dozens of compounds were established with the aid of the dielectric theory of the chemical bond for complex crystals: EA = 6.2187−1.7584he, EB = 7.019−1.957he, EC = 7.259−1.964he. Environmental factor he of Cd site was calculated to be 1.6583 with the refined crystal structure and refractive index of cdwo4 crystals:Sb3+. Sb3+-doped cdwo4 crystals was synthesized through a precipitation method and its structure was refined with the General Structure Analysis System. The transition energy of A band of Sb3+ in cdwo4 crystals can be predicted to be 3.312 eV (374 nm), according to the relationship equation between EA and environmental factor he. By monitoring the 521 nm emission band, the excitation spectrum gives a weak excitation band peaking at 355 nm, which was assigned to the 1S0–3P1 transition of Sb3+ according to our prediction. Thus, Sb3+-doped cdwo4 crystals phosphor was designed and synthesized successfully based on sp energy levels regularities of Sb3+ ion. This work is a great help to understand the spectroscopy of Sb3+ ion and will be useful for the design and development of Sb3+-doped phosphors for applications. Long wave pass optical filters provide a sharp cut-off below a particular wavelength. Often used for order sorting, they isolate broad regions of the spectrum, simultaneously providing high transmission of desired energy, and deep rejection of unwanted energy. 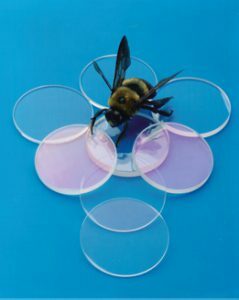 Constructed of hard, durable first-surface dielectric coatings on optical-quality IR-transmitting substrates, these long wave pass optical filters will withstand normal cleaning and handling associated with any high-quality optical component. For your convenience and economy, we offer the filters in two standard sizes: 25mm and 50mm dia. However, we can produce custom sizes and shapes, as well as custom optical characteristics. We also offer long pass filter in the UV and visible wavelength ranges, including steep-edge long pass filters.